Join us for a presentation on Ayurvedic practices that consider Food as Medicine, as presented by Shakthi Ayurvedic. Event takes place at the Keauhou Farmers Market, 9:30am, on Sat. Apr 27th. Market opens at 8 so come shop, learn, taste, and explore! Twice a year we run an initiative that encourages folks to get out and garden – or create an indoor window garden. Here is the April 2019 Spring newsletter. From micro sprouts in your kitchen, to a backyard garden, there are great rewarding ways to Grow it Yourself! Join us for a fun and tasty breadfruit talk and tasting at the Keauhou Farmers’ Market on 3/23 with presentations by the Hawai’i ‘Ulu Coop. 9:30-11am in Kona at the Keauhou Shopping Center on Ali’i Drive. Event on 23rd is free to the public with options to purchase products from the Coop on site through noon. On March 30th, we are hosting a farm tour and cooking class at Kuaiwi Farm. Space is limited so click here to learn more about both events. Tour and class registration first come first serve, closes 3/24. Taught by Vivienne Aronowitz MPH, RD, CDE. Open to ALL. Learn about Plant Strong eating and how it can improve your health and sense of wellbeing. This 90-minute class will help you understand the elements and benefits of a plant strong diet and provide the menus and cooking skills necessary to live a healthier life. The follow-up Plant Strong Intensive course will build upon the introductory course so you can successfully transition to a plant strong lifestyle. See Feb-March info below. Open free to the Community. No insurance needed. Pre-registration is required. Deadline to register is January 25, 2019. For SNAP/EBT Same Canoe Members: For Same Canoe members, the first 20 who enroll and attend this free class get 2 $10 coupons, plus can also earn a free scholarship to attend the follow-up 3 session classes with Vivienne and Chef Stephen – see below. Let us know once you have registered by sending a message using the form below. Celebrate Fruits and Veggies – 3 Session Class with Chef Stephen Rouelle and Vivienne Aronowitz. Great way to see new recipes in action, learn how they help your health, and taste chef-made delicious food. February – March. Open to All. FREE for 1st Twenty Same Canoe Members who enroll! Vivienne Aronowitz, MPH, RD, CDE with Chef and recent cookbook author Stephen Rouelle from Under the Bodhi Tree restaurant will be preparing the food. This fun and lively three-session class will help you adopt and improve a plant-strong diet. Note: Attending the Intro to a Plant Strong Diet class on 1/30 or a one-on-one appointment with registered dietitian are pre-requisites for enrolling into this class. Deadline to register is February 8, 2019. Regular Cost: $50 per person. Includes a full dinner to sample the prepared dishes. Same Canoe members who attend 1/30 class can request a full scholarship, first come first served, up to twenty, at no cost for these 3 classes. To request scholarship: email hawaii@oneisland.org or send a message using the form below. Must be enrolled in Same Canoe as a SNAP user and attend 1/30 class. Tour participants take home a bottle of their magic brew too! Getting to know local farmers – and the creative entrepreneurs who bring us exceptional value-added products – is a great way to support your local food system. $20 per person / $30 couple including tour AND a bottle of their magic brew! 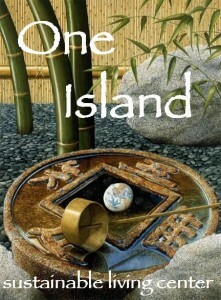 Email hawaii@oneisland.org to RSVP and get directions. (FREE for our SNAP Same Canoe members and One Island members). Please join us in considering public cultural uses for the central greenspace in Hawi that has been purchased by the County. What are possible / best uses? How can public commons areas enhance community connections and pride of place? What is missing from North Kohala that might be a benefit if created here? Are there public art events or small structures that would enhance community life? Who could such a park space serve? How can all ages be engaged? What would the impacts of a new public park space be? Public input is welcome and will be included in a forthcoming Cultural Plan document recording public needs and interests in the Cultural Arts. Our new Local Food Challenge Passports are a fun activity tracker. Local residents can use the colorful printed Passport to attend engaging food and farm events offered by a variety of organizations. This is a great way to earn points for entry in drawings for food or restaurant gift certificates, and for free passes to special events. See the list of approved events below. Request your Passport at an event or at our Same Canoe market booths as shown on the calendar. Enrolled Same Canoe SNAP/EBT users can also use the Passports for education and healthy living activity tracking. Classes, workshops and tours earn points towards local produce coupons. Enjoy a powerful film and learn about local access to Community Supported Agriculture for fruit, veggies and grains. All at the fun, hip, Iwa Arts and Cafe. Guests speakers from Adaptations and Sundog. Visit Nancy Redfeather and Gerry Hebert’s legendary homestead to learn about seed trials and seed sovereignty. Add yourself to the wait list and to be added to notifications for the next session as this one is filled up. Cascading hillsides of tea plants in a forested area with expert instruction on tea production, processing and benefits. This year their Open Farm Day theme is ‘Tasting Natural Teas’. Come join the tour to learn about Natural production and enjoy tasting the pure products of Mauna Kea’s clean growing philosophy. To RSVP, please email or call 808-775-1171. The rallying cry for Same Canoe is to DOUBLE local food purchases at farmers’ markets, grocers and restaurants to help build our ag economy and to strengthen our island’s food security. HOW are we going to do this? 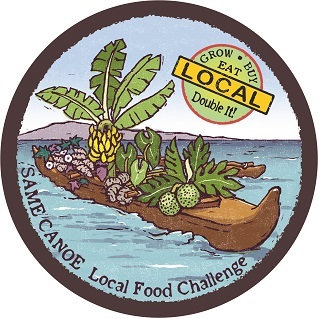 The Same Canoe campaign has raised over $750,000 for this 2017-2020 effort with a large investment focused on helping low income households earn free coupons for fresh, local fruits and veggies. A clear, measurable result is putting new dollars in farmers’ hands – bringing them new customers, building their businesses and rewarding their heroic hard work. Meet our great AmeriCorps Team helping to get the word out, enroll participants, and get the coupons circulating at our partner sites. The members are both Island residents and one-year visitors – all eager to paddle the local food canoe. Kudos to Anna, Lisa, Laura and Markus for grabbing a paddle and moving the canoe forwards! NEW this year is VEGGIE Rx – a great way for health care providers to prescribe fresh, local fruits and vegetables. Mahalo to our valuable partnerships with local health care organizations – West Hawaii Community Health Care, Hamakua-Kohala Health, Hui Malama Ola Na Oiwi, Island Heart Care. Find us at Hamakua Harvest, Hawi, Kamuela, Kona Sunset, Keauhou and Pure Kona Farmers’ Markets – plus Island Naturals, Healthways, Choice Mart, Takata Store and Kohala Gown Market every month in 2018. Plus special events like the Culinary Arts Under the Stars, Kohala JAMboree and more.